Our old process for assembling the PDFs into one customer-ready PDF of the ARCVAL system documentation used to take 40 to 60 hours. Now using Flare, we can build it in about an hour. Fast Production - With Flare’s topic-based single-source publishing, ARC can build the CASE online Help and 5 PDF files in 1 hour. Flare also has cut the time to build ARCVAL legacy documentation from 40-plus hours to 1 hour. Efficient Development - Conditional text, snippets and variables in Flare enable ARC to repurpose content. Integration with Microsoft® TFS® allows source documentation files to be stored with the same level of protection and recoverability as the CASE source code. Collaboration - Microsoft® Word import feature in Flare enables subject matter experts to contribute content using familiar software. Flare integration with TFS® allows the ARC writers to create a system for tracking work-in-progress and producing status reports. Intuitive User Experience - Context-sensitive Help, enabled by Flare and available for 700-plus unique screens in CASE, lets users get to the right topic page simply by clicking the Help button. Provide modern documentation for its CASE platform, which can keep pace with monthly updates to the software. Migrate the legacy ARCVAL documentation to a modern publishing system to cut the time required to update and build new documentation versions. Provide a central repository for all source content, which makes it easily accessible. Enable the single-source publishing of content into online Help and a range of print guides. Support industry-standard formats to provide flexibility in adapting to future requirements. Actuarial Resources Corporation (ARC) is a nationally recognized actuarial software and consulting firm dedicated to serving insurance institutions. Since 1987, the company has been delivering enterprise-level software solutions for life, annuity and health insurers anchored around its comprehensive ARCVAL financial analysis system. More recently, ARC began offering the Consolidated Actuarial Systems Environment (CASE), the platform for the next generation of the ARCVAL system, which simplifies and streamlines how information is managed. To help its insurance industry customers take full advantage of the capabilities in ARCVAL and CASE, ARC delivers documentation both as online Help and PDF files using the single-source publishing capabilities of MadCap Flare. In the process, ARC has achieved more than a 40-fold reduction in the time that it takes to build its legacy documentation. For years, ARCVAL documentation was delivered once each year in a 3,700-page PDF, created in various source files from Microsoft® Word, Microsoft® PowerPoint™, and the LaTeX documentation preparation system, among others. In addition to the PDF, online Help for ARCVAL was created in ForeHelp, but the ARC team found that it no longer supported the functionality they needed. The next-generation CASE platform, featuring a new architecture, was built using the agile software development methodology, and it was designed with the idea that updates would occur monthly. This would require all supporting documentation to be updated monthly as well. It quickly became clear that ARC would need a new approach to producing its online Help and guides. ARC then zoned in on three main requirements for a new authoring tool. First, it needed to support a central repository for all source content, ensuring that this content would be easily accessible and that source files would never be lost. Second, it needed to provide single-source capabilities, so the same content could be reused in multiple forms of output, including configuration guides and the online Help system. Finally, it had to support industry-standard formats to provide flexibility in adapting to future requirements over the lifespan of CASE. To address its requirements, ARC has turned to MadCap Flare with its topic-based authoring, ability to publish multiple types of output from the same project, capabilities for context-sensitive Help, and architecture based on industry-standard XML. 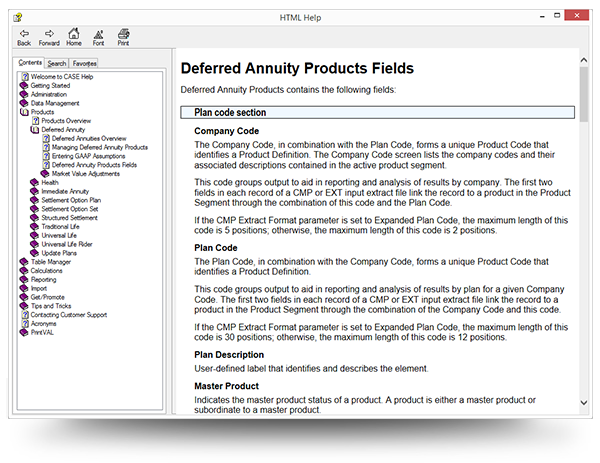 ARC not only has created new content for CASE; the company also has migrated legacy ARCVAL documentation to Flare to simplify the management and publishing of existing content. The initial release of CASE consisted of approximately 700 screens with 3,500 fields that all required documentation. However, the ARC team had an opportunity to design a new documentation structure while also leveraging content and experience from the legacy ARCVAL system. With the future in mind, ARC’s writers set up the Flare project, designing an information architecture for the documentation set and creating an initial outline for each deliverable. Planning and configuring the backend structure of the Flare project included defining the folder structure, establishing file naming conventions, and creating a logical architecture for implementing context-sensitivity at the screen level. In implementing the project, the writers followed structured authoring guidelines and created topics using the “concept/task/reference” topic-based authoring model. They also took advantage of several features in MadCap Flare to support content reuse and single sourcing, including variables, snippets and conditional text. Using Flare, they created page layouts for PDF output that replicated the look and feel of existing corporate templates. Additionally, the writers integrated Flare with Microsoft® Team Foundation Server® (TFS) to provide the documentation files the same level of protection and recoverability as the CASE source code. A 123-page Installation Guide for network and database administrators. 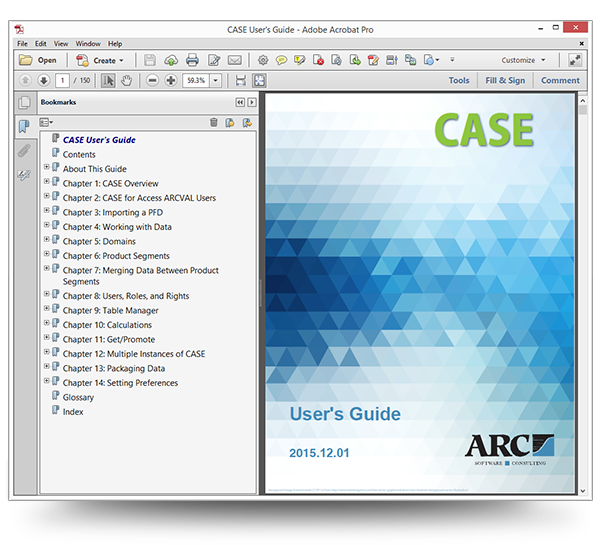 A 128-page User’s Guide describing essential tasks for using the CASE application. A 30-page Operations Guide covering advanced-level tasks for operating and maintaining CASE. A 176-page Financial Projections (GAAP) Guide with procedural and reference information. A 13-page CheckPFD Guide describing the utility required for legacy ARCVAL users preparing to upgrade to CASE. Equally important is the modern, user-friendly experience that the CASE online Help provides. One of the popular features with ARC customers is the context-sensitive online Help available for more than 700 unique screens in the CASE platform, which was enabled by MadCap Flare. 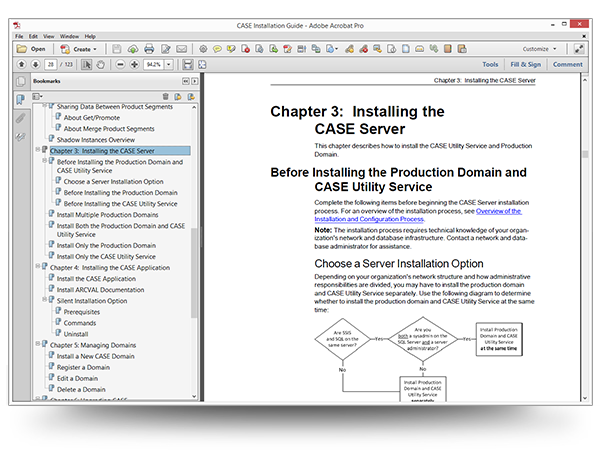 CASE users also require access to certain legacy ARCVAL documentation. Therefore, ARC has migrated the legacy documentation to a MadCap Flare project as well. The original ARCVAL documentation spanned 3,700 pages and was divided into 13 chapters that each described a separate module of the ARCVAL system. To start, ARC’s writers created a new Flare project for the ARCVAL system documentation. Each chapter, or module, from the original documentation was recreated as a separate PDF target, and within each chapter, the content followed a structure similar to the original documentation. The process of importing content varied slightly depending on the type of information being imported. Some content, such as conceptual descriptions and process flow diagrams, imported easily. Much more difficult to migrate were some 100 Word files formatted almost entirely in tables that produced 2,000 pages of content. Through file tagging, Flare has made it really easy to track my progress, and at the end of the year, I was able to give management the exact number of topics I had completed. 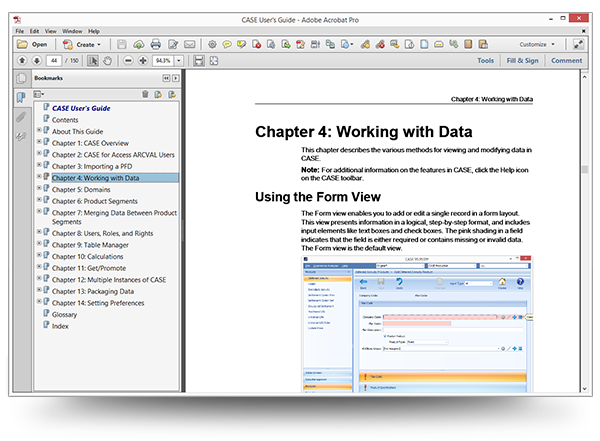 ARC takes advantage of many additional features in MadCap Flare to facilitate content design and development, including cascading style sheets (CSS), the XML editor, and file tagging. The fact that MadCap Flare is based on XML and includes a built-in XML editor also helps ARC to simplify document maintenance. Meanwhile, to handle the 700-plus topics in the CASE Help system, ARC writers have used MadCap Flare to create a system for tracking work-in-progress and producing status reports. It consists of a series of file tags in Flare that reflect the type of information with a topic and whether it is complete. When working on a topic, the writer selects the appropriate file tags from the topic properties window in Flare. I like the fact that Flare handles the checking in and out of the content in TFS® with one simple click of a button. MadCap Flare’s integration with Microsoft® TFS®, not only makes it easy to check the source documentation files into the platform’s source code; it also facilitates collaboration among ARC team members. “Our team uses TFS® to create a system for tracking work items during each sprint, and I can easily integrate my latest output into the code builds. We are able to see how our content is converged. I like the fact that Flare handles the checking in and out of the source content in TFS® with one simple click of a button,” Danda explains. Additionally, the Word integration functionality in Flare makes it easy for subject matter experts (SMEs) to contribute content. With the MadCap Flare-based CASE and ARCVAL documentation projects in production, ARC writers are looking at how to enhance content development and maintenance. One area of particular interest is taking advantage of MadCap Flare’s standard XML architecture to automate the creation of hyperlinks.